It takes some time to send a thank-you note after a job interview, but it can be well worth it. 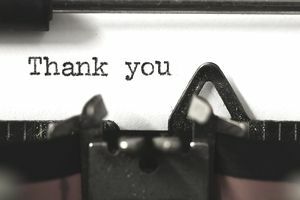 According to an AccountTemps survey, about eighty percent of managers said they consider a thank-you note influential when evaluating candidates. It's important to note that only twenty-four percent of job applicants sent a thank-you note after an interview. So, if you're one of the applicants who does spend a few minutes taking the time to send a thank-you note to your interviewers, it will help you to stand out. Read below for advice on how to send a thank-you note, and general tips on writing a note. Also read below for sample thank-you letters. Before writing your note, think carefully about the format of your thank-you message. If you have the time, you might mail a handwritten note. It is a more personal format. However, if you know the employer is going to make a hiring decision quickly, you should send an email thank-you note instead. According to the AccountTemps survey mentioned above, 94 percent of employers said email thank-you notes were acceptable. 86 percent of employers said hand-written notes were acceptable. Other possible ways to say “thank you” are via a phone call (as long as you do not call too many times) and social media (including a private message on LinkedIn). One format to avoid is text message – only 5 percent of employers thought text messages were appropriate. Send It as Soon as Possible: Whatever format you choose, send your thank-you note as quickly as possible. You want the employer to see the letter while your interview is still fresh in his or her mind. You also want to send your letter before they make a hiring decision because the letter might help your chances. Send One to Every Interviewer: If you were interviewed by a panel, consider sending a note to each person. Address them by name, rather than sending a generic letter or email. Buy Notecards: If you decide to write a handwritten note, keep a box of generic thank-you notes on hand, along with a supply of stamps. Or, consider a personal thank-you note with your photo included. It's a good way to remind the interviewer who you are, as well as reiterate your interest in the job. Sell Yourself: Use your thank-you letter not only to express gratitude for the chance to interview but also to (briefly) remind the interviewer about your key qualifications for the job and to reiterate your interest in the position. Mention Anything You Forgot: If there was an important point you forgot to make during your interview (for example, an important related experience you did not mention), you could briefly include it here. Keep It Brief: Keep your thank-you note brief – no more than a couple of very short paragraphs. Edit, Edit, Edit: Even though the interview is done, this note is still part of the hiring process. You want to make sure your letter is well-written and, if handwritten, that your handwriting is clear. Read through your letter before sending it, checking for any errors. You can also review thank-you letter writing tips for advice on what to write. Also, here are thank-you quotes you can use to create your thank-you notes and letters. If you're not sure what to write, review thank-you note samples applicable to a variety of employment-related situations. Edit the thank-you note example you select, so it reflects your personality and the specific job you are applying for. An influence letter is another way to give your thanks and to share more detailed information on why you would be an asset to the employer. Here's how and when to write an influence letter instead of a thank-you letter. Need more ideas about how to perfect your thank-you letters? Writing Thank-You Notes provides more information about how to write a thank-you letter, including who to thank, what to write, and when to write an employment-related thank-you letter. Additional thank-you note suggestions, samples, and other job search correspondence can be found by clicking Thank-You Notes.